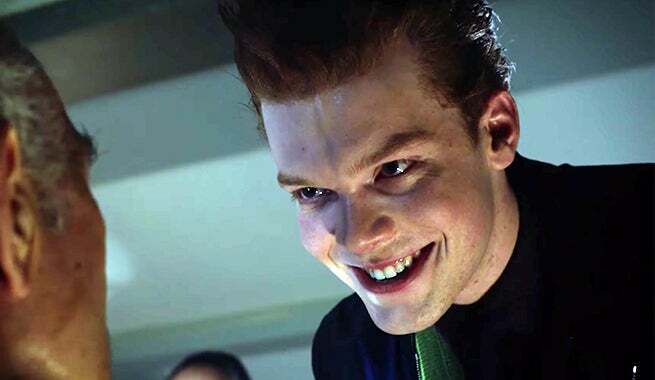 SPOILERS Ahead for last night's episode of Gotham, "The Last Laugh!" Jerome came into Gotham with a laugh and went out with a smile. After terrorizing Gotham with the assistance of Theo Galavan and Barbara Kean, Jerome, a prototypical version of The Joker, was killed just when he thought he was having his greatest moment. It was a shock to Gotham fans after a summer full of promotion and marketing that seemed almost entirely centered on the character. After all, this guy was The Joker right? With immense critical acclaim of Cameron Monaghan's performance as the maniacal, laughing criminal and a nearly instant fan following, it seemed like offing his character would be a tough call. Not as much as you might think, said showrunner Bruno Heller in an interview with ComicBook.com. "There was no second guessing there; it’s very much part of the story we’re trying to tell," he said during a phone interview. The reason is simple: they want to do The Joker justice. "The Joker is very much the crown jewel of DC villains, I think everyone would agree," the showrunner said. "He’s the most mysterious and the most powerful and so the story of his origins needed to be as complex and profound and as real as possible. We decided early on to tell the long story of the creation of the Joker, which will involve many more twists and turns than the audience will be expecting." Of course, saying goodbye to Monaghan was difficult, and there was at least a moment's hesitation in ending his story so early. "We always knew, it’s one of those things, when we saw Cameron’s performance and how brilliant he was, there was a moment of 'oh hell, this guy is genius!'" Heller said with a laugh. "But we had a storyline that has to go how it has to go, otherwise it’d be cheating. So to that degree, there was some second guessing that 'oh hell, we’re losing this brilliant young actor.'" Ultimately though, Jerome had to die, and his inspiration had to live on. Bruno Heller said in response to a question about the comedian that appeared on the pilot episode over a year ago, "The Joker didn't think of his shtick all by himself; there must have been someone before who The Joker saw and though, 'oh, that's a good shtick, I can work with that and make it better.'" If that sounds like exactly what happened, there's a reason: he actually had this Jerome arc for the start of season two planned out at the start of season one. "Mmm-hmm!" Heller said with another chuckle when asked whether this exact plan went back that far. "Again, I’ve been in this business for a long time. If you don’t think ahead, especially with a story like this, you have to think ahead, you have to not just have an episode-by-episode sense of what you’re doing, but you have to have a historical sense of what you’re doing." As for what's next for The Joker on Gotham, it's all been thoroughly planned out. At the end of the episode, multiple new characters were introduced, seeing Jerome's crimes on a news broadcast and beginning to laugh along with him. Some of them immediately went out and committed brutal crimes of their own, and some of them may come back to haunt Gotham later. "What I can promise you is that from episode three and what follows, and we would ask the audience to hold faith in the storytelling here, is going to be completely satisfying, completely coherent with the larger Joker myth, and will tell a story that really explains the entire sort of cultural history of how the Joker came to be," said Heller. "Rather than just, and I hate to use the word ‘comic book’ in these terms, but it’s not a ‘comic book’ origin, it’s a ‘graphic novel’ origin. Hopefully it will have that sense of not just character reality but social reality, and depth." Ultimately, Heller and his staff understand that doing any kind of origin for The Joker, even one that's more spiritual than literal, is a difficult topic to tackle. "It’s a scary thing to do, to be playing with dynamite when you’re playing with a character like the Joker. All I’d say is we’ll be throwing more twists and surprises at the audience, but I’m willing to bet that they’ll be happy with where we take it."